Jan. 18, 2017, 12:53 p.m.
By Laura Hazard Owen @laurahazardowen Jan. 18, 2017, 12:53 p.m.
Where do you go, these days, if you want to read news without feeling utterly hopeless about the state of the world? The Christian Science Monitor wants to be that slightly more hopeful place — not by glossing over serious global problems, but by providing counterintuitive insights on issues from the crisis in Aleppo to global warming. 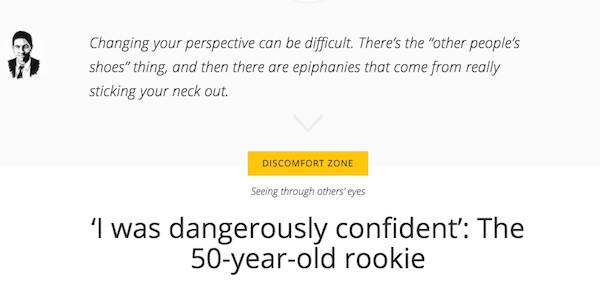 For three days last November, thousands of Monitor readers were invited to read a series of stories designed to get them out of their news comfort zones. “These turbulent and divisive times require a new approach to how we cover and understand the most important issues of our day,” Monitor editor Marshall Ingwerson told readers in an email, inviting them to look at a project that “aims to see the world more clearly,” and then take a survey about it. But the Monitor isn’t just trying to cover news differently once in awhile. The November experiment was the latest step in a year-long process to revamp its online presence, with the goal of ultimately figuring out a new (and, hopefully, paid) digital identity for the Monitor. It’s been almost eight years since the Christian Science Monitor shut down its daily print edition and went web-first, with a weekly print magazine. Web revenue and traffic climbed through 2012 — “then started topping out,” Ingwerson told me. “We realized that, even though we were aggressively growing our revenue, it would never pay for the newsgathering operation.” The print magazine’s circulation is down to around 40,000, from about 60,000 in 2012. 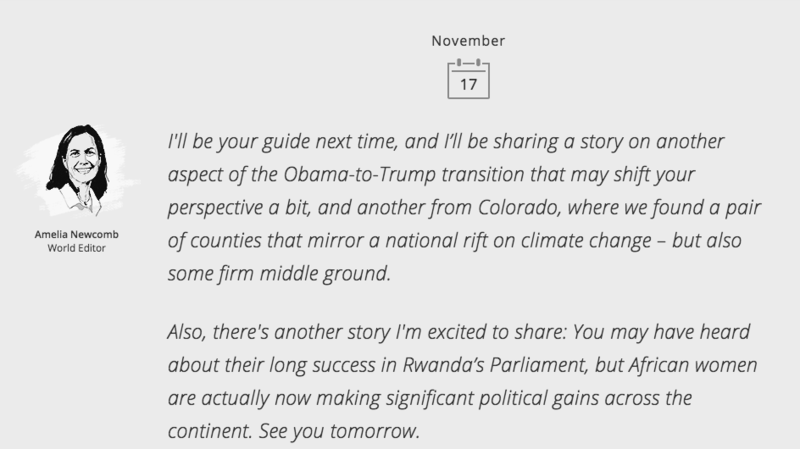 Ingwerson believes that the Monitor’s digital future is built around shifting perspectives on current events, with a voice that is “calm and fact-based and fundamentally constructive, and assumes that our readers are looking to have a fundamentally constructive approach to the news.” Planning for the new project began long before November 8, but feels especially pressing in the aftermath of the 2016 presidential election. The Monitor started out by testing its new product with a focus group of eight people, then sent it to thousands on November 16, 17, and 18, along with a survey link. About 1,900 people took the survey. 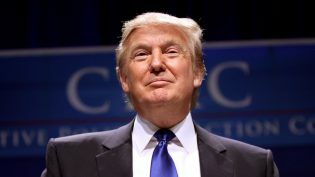 Respondents “got that we were trying to give them a different perspective on the news, with the ultimate goal that they understand other people better and might ultimately find common ground with them,” Ingwerson said. Such relentless consistency is difficult — both in the context of this beta and, more broadly, in the newsroom. “Our content engine isn’t yet producing this core content as its primary output,” Collins said, and that shift takes buy-in, time, and training — first at the editor level, and editors must then transmit it to their writers. When Ingwerson spoke about the need to understand white working-class Trump voters in the center of the country, I asked him whether a mission to provide more “perspective” placed the burden of understanding on progressive readers while ignoring some of the racism and hatred that marked the election, or insisting on seeing bigotry in a “balanced” way. Collins stressed the importance of voice, and how the Monitor’s new product takes the tone of being a guide to the news. “The product we tested uses the editor-moderated approach to story introduction: ‘Here’s what we’re sharing and why. '” Readers need to understand the value of the story immediately and know that what they’ll find in it is different from what they’ve seen in other stories on the topic. Still, while readers appeared to appreciate this type of content, enthusiasm didn’t translate into high traffic, at least not in these tests. The second and third test emails that the Monitor sent out got fewer opens than the first one did. Most of the people who took the survey also didn’t seem to understand that what they were looking at was a “central, replacement product” for the Monitor’s current site, rather than some sort of limited-time “add-on.” Possibly because of that, “we heard more often that it was too much content than too little,” Collins said. The Monitor wants to lift that engagement rate, of course, but there’s no guarantee that a total revamp of the site, with a paid product at its center, will succeed in doing so. “Our approach is that most news events involve deep levels of nuance, and many portrayals of news are wildly reductive. 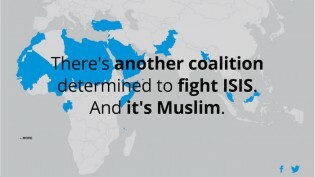 Part of that is media organizations or social media trying to make the complex super-accessible,” Collins said. “How do we make a news story or news event a starting point for deeper consideration — including considering a range of perspectives that they hadn’t previously weighed, or even thought about?” Such a project doesn’t just require more work from editors and writers, who need to learn to convey stories in a new way; it also requires more work from readers, who may already feel overwhelmed by information. Still, the Monitor is pressing forward with the hopes that this can become a habit-forming product. While the team hasn’t yet settled on a possible price point (there would always be some content outside a paywall, Collins said), they are aiming for a daily, paid, digital product by April. 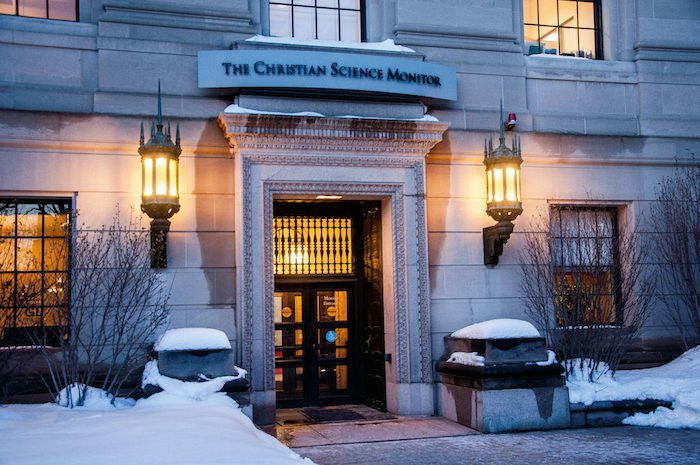 Photo of The Christian Science Monitor by Sarah Nichols used under a Creative Commons license. POSTED Jan. 18, 2017, 12:53 p.m.
Owen, Laura Hazard. "The Christian Science Monitor is betting big on constructive, non-depressing (but paid-for) news." Nieman Journalism Lab. Nieman Foundation for Journalism at Harvard, 18 Jan. 2017. Web. 19 Apr. 2019. Owen, Laura Hazard. "The Christian Science Monitor is betting big on constructive, non-depressing (but paid-for) news." Nieman Journalism Lab. Last modified January 18, 2017. Accessed April 19, 2019. https://www.niemanlab.org/2017/01/the-christian-science-monitor-is-betting-big-on-constructive-non-depressing-but-paid-for-news/.